Although ponds are a less expensive water storage option than tanks a significant drawback has been the inability to control pond water temperatures. Layfield’s REVOC Insulated floating cover solves that problem by placing a layer of designed insulation permanently on the top of an open pond. Adding insulation to the top of a pond provides a number of benefits including the ability to control water temperatures for process water, conservation of energy for heated water ponds, and the extension of seasonal water treatment activity in cold climates. All floating covers provide some control of temperature by preventing water evaporation. REVOC Insulated covers add up to 4” (100 mm) of insulation to the top of a pond allowing the designer to control temperatures accurately. 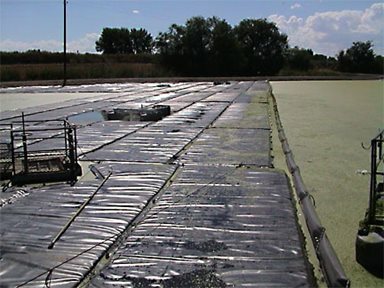 REVOC Insulated covers can be installed on open ponds, open topped tanks, and combined with a REVOC Biogas cover to collect biogas.